Good ol’ Captain Disaster. At some point he’ll hopefully be able to change his name. Yeah. Someday. I mean, for a character so du- down on his luck, he did plenty good(?) 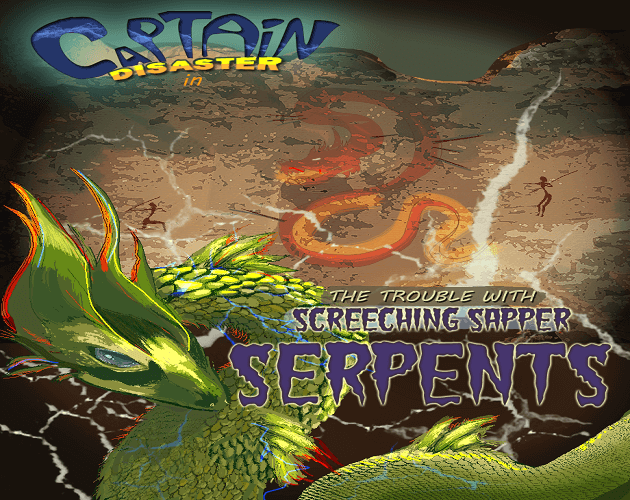 during Captain Disaster in: Death Has A Million Stomping Boots, precursor to Captain Disaster in: The Trouble With Screeching Sapper Serpents (what’s with these long titles anyway?). And as fate would have it, the time has come for the captain to once more save the day – or die trying. We’re doomed. Seriously though, he’s quite the colorful character (surely you’ve read my review of Death Has A Million Stomping Boots, right? ), never letting even the most insurmountable obstacle get him down. Which is a good thing, seeing how a supposedly extinct creature is wreaking havoc on Proboscis Major. A planet that he kinda visited in his prior adventure… something something events, trouble, bad news now. No rest for the wicked, as they say, and that goes double for Captain Disaster. Exactly why he’s the only one capable of dealing with/preventing this potential planet-wide disaster is beyond me. But hey, so long as it brings about more good times with cheesy puns, pop culture references and low-resolution pointy and clicky fun, I’m game. Ah, if only those weren’t pretty much the only details revealed at this point. Not even a WIP in-game screenshot (no, the picture atop is not that). As such, for now, all we can do is keep an eye on the game’s itch.io page/devlog, fingers crossed that Captain Disaster in: The Trouble With Screeching Sapper Serpents will be out sooner rather than later!